KENT, OH, December 5, 2018 – Award-winning Managed IT Services provider, QualityIP, announced a recent promotion. 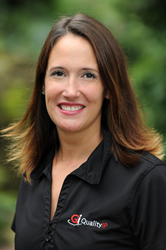 Jennifer Hendershot, an experienced Cisco certified IT technician, has been with QualityIP for three years. She has been promoted from Technical Account Manager, serving some of their largest clients, to the newly created position of Technical Operations Manager. In her new role, Hendershot will oversee communications between their team of thirty technicians, their clients, and internal management. Additionally, she is responsible for the development and implementation of standard operating procedures as well as internal policies and procedures the technical team will follow. Oversight of client projects also are part of her new responsibilities as Technical Operations Manager. Read our press release on PRWeb.